Colgate University’s Picker Art Gallery unveils an exhibition of This Place Thursday, February 1, as part of a dynamic cooperative among four upstate New York schools designed to enhance opportunities for cross-disciplinary learning in museums. 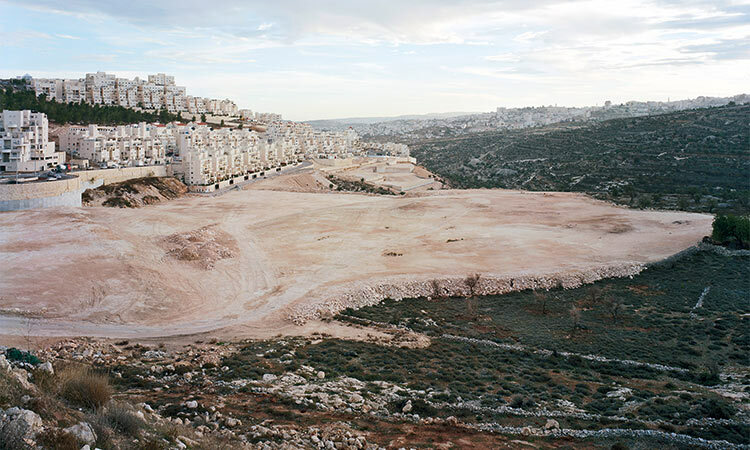 Part of a massive, international project conceived and orchestrated by French photographer Frédéric Brenner, This Place features a variety of perspectives on Israel and the West Bank. Colgate’s portion of the exhibition features photographs taken between 2009 and 2012 by Josef Koudelka, Rosalind Fox Solomon, Thomas Struth, and Nick Waplington. Each of these renowned photographers brings a unique approach, style, and history to reveal a complex, fragmented, and paradoxical portrait of the land and its peoples. The photographs on view at Colgate until May 20 represent about one-fourth of the full traveling exhibition. The Picker has partnered with the Tang Teaching Museum at Skidmore College, the University Art Museum at the University at Albany, State University of New York, and the Wellin Museum of Art at Hamilton College to present all four portions of the exhibition concurrently. This collaboration, organized by professors and museum staff at Skidmore and generously funded by the Teagle Foundation, aims to investigate and develop innovative approaches to teaching and learning with exhibitions at academic museums. Colgate professors in disciplines ranging from the arts and political science to history, religion, theater, philosophy, and creative writing will be incorporating This Place into their spring-semester courses. Prior to this university collaboration, This Place originally opened in 2014 at the DOX Centre for Contemporary Art in Prague, from there traveling to Tel Aviv and West Palm Beach. While on display at the Brooklyn Museum in 2016, the show became the focus of controversy and criticism in news media and arts journalism. The critique centered around the fact that none of the 12 featured photographers are from Israel or Palestine, but rather offer “outsiders’” perspectives — and, arguably, sanitized or aestheticized ones — of a fiercely contested and politically fraught region. As a result, what might have previously been seen as a high-status collection of important art photographs is now a focal point for examining the complexities of neo-colonialism, neo-liberalism, the relationship between cultural institutions (“soft power”) and political power, the contested right of representation, and the multiple meanings of works of art. Art history and museum studies professor Elizabeth Marlowe, who will be using This Place for half of her Arts 255 course Museum Exhibitions: Design, Rhetoric, and Interpretation, said the exhibition is ripe with opportunity for debate and contextual analysis. For Xan Karn, a history professor, This Place presents a special cross-disciplinary learning opportunity for his Politics of History course. Karn’s students will join their peers in both a philosophy and an art history course when they travel to the other exhibition locations in March. This Place artist Rosalind Fox Solomon will speak about the people and the places in her series of photographs, THEM, on view in the exhibition. Gilad Baram, assistant to This Place artist Josef Koudelka, follows the photographer on his journey through the Holy Land from one enigmatic and visually spectacular location to another. In each location—soon to become a “Koudelka photo”—a new scene unfolds, gradually introducing us to Koudelka’s method of working, as well as his perception of the world he is documenting and the people he encounters. Visit colgate.edu/picker and select “Exhibitions” for a full listing of exhibition-related events.